Artichoke grows in the Mediterranean region where this pleasantly bitter vegetable is consumed as a gourmet food. This liver herb is used for digestive disorders and to prevent heart disease. Research confirms artichoke lowers cholesterol and triglycerides by decreasing their production in the liver. 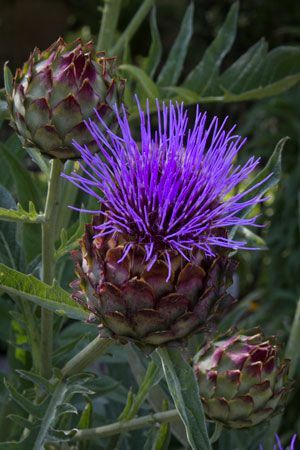 Also, artichoke increases the production and release of bile to assist with lipid metabolism and digestion. In addition, artichoke is rich in antioxidants that helps reduce free radical damage that leads atherosclerosis. The bitter taste of artichoke is attributed to the sesquiterpene lactone cynaropicrin. Although significantly less bitter than some herbs like Gentian, the artichoke is a valuable herb in dyspeptic conditions associated with heaviness, poor appetite, nausea, stomach pain, and constipation. Artichoke also has documented prokinetic effects to increase intestinal motility and also antispasmodic properties to decrease cramping pains. Research suggests it can improve pain associated with irritable bowel syndrome. The liver also receives benefit from the consumption of milk thistle. Historically it was used for hepatitis and jaundice. Some of its constituents have hepatoprotective effects, and research suggests it aids fatty liver disease.